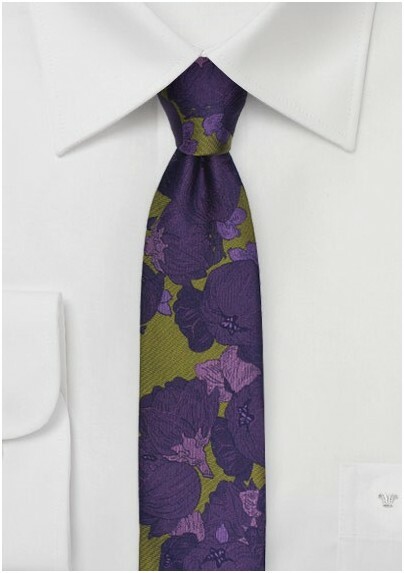 Try our new fashion-forward, skinny tie that draws from a rich palette mustard-chartreuse and purple with vintage floral designs. Much like an ornate Victorian design, these stylized floral motifs will make your outfit shine without being excessively showy. 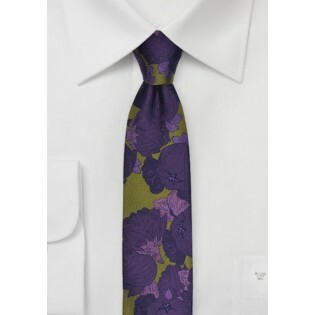 Dark and light purples combine beautifully on a yellow-green background to create a richly vibrant accessory. Fabric: 100% Woven Silk | Length: 58", Skinny Width: 2.35"